Book & CD-ROM. The U.S. Department of Energy (DOE) defines an abandoned uranium mine (mine) as a named mine or complex developed to extract uranium ore for atomic energy defense-related activities of the United States from 1947 to 1970, as verified by purchase of ore by the U.S. Atomic Energy Commission (AEC) or other means. 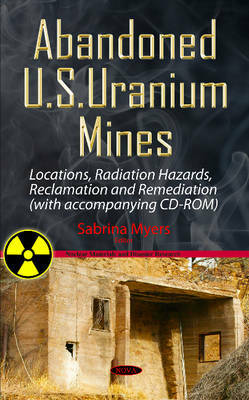 This book addresses five issues which include the location of defense-related abandoned uranium mines on federal, state, tribal, and private lands; the extent of radiation hazards, other public health and safety threats, and environmental degradation caused, or may have been caused, by the mines; a priority ranking to reclaim and remediate the mines; the potential cost and feasibility of reclamation and remediation in accordance with applicable federal law; and the status of any mine reclamation and remediation efforts. This book is accompanied by a CD-ROM which includes three reports on defense-related uranium mines locations; the radiological risk to human health and the environment; and prioritization.